Vlado Novak was born on 9th April, 1952, in Maribor. In 1974 he graduated from Economy College in Maribor and began with studies at Academy for Theatre, Radio, Film and Television in Ljubljana. In 1975 he left the Academy to serve the Yugoslav Army. In season 1976/77 he was employed as an actor in Drama Theatre in Nova Gorica, and in 1977/1978 he became an actor member in Slovenian National Drama Theatre in Maribor. In 1981 he entered the final year of his studies at the University of Ljubljana and finaly graduated in acting in 1995. 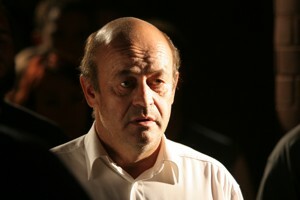 Vlado Novak is one of the most visible theatre and film actors in Slovenia. He has so far appeared in more than a hundred theatre plays, mostly in leading roles, as well as in many films. In 1985 he received Prešern's Fund Award, a prestigious Glazer's Award, Marulić Award in Split (for the part of Don Zan) and seven Borštnik Awards: in 1985 award for the part of Simon Veber, in 1989 award for the part of Jannings, in 1993 award for the part of Simeon Piščika in The Cherry Orchard (adapted after A.P. Chekhov), in 1996 award for the part of Robert in Betrayal (adapted after Harold Pinter), in 2004 award for the part of W. Loman. In 1995 Vlado Novak also received Stop Award for the best actor of the year for his part in the film Stryptych (orig. title. Striptih; directed by F. R. Dorin).